PKI ELECTRONIC INTELLIGENCE GmbH is one of the leading distributors worldwide for night vision devices. Although the optics play a critical role of the night vision device, the heart of a night vision device and the most important component is the Image Intensifier Tube (IIT). As a leading consumer for ITTs we source and aquire the best and the latest available image intensification technologies from top US and European producers. From hand selected premium grade 1st Generation to filmless/autogated 4th Generation that would satisfy the most performance obsessed clientele, we offer the best for your specific application. When you see night vision units with built-in infrared illuminators for total darkness, remember that we were one of the first to offer this feature that now has become an industry standard. All of our night vision units are outfitted with an IRilluminator. Furthermore some of such devices offer interchangeable lenses, opitcal doublers and remote controls. Our R&D engineers are making sure that we are always on the cutting edge providing you with the latest in features and technology. 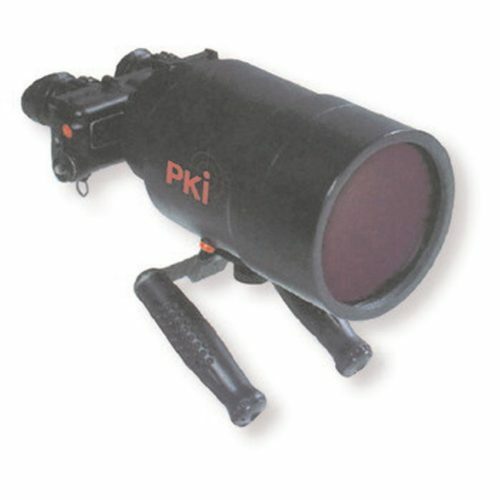 The PKI 5240 as an infrared, low light level device for the use in public security, armed police forces, custom houses, frontier – and safe guards for night patrols as well as investigations. In one word, the operator cannot miss using the PKI 5240 in any kind of night observations. Being fully portable, self-powered and lightweight, this system offers a reliable tool at a cost-effective price.